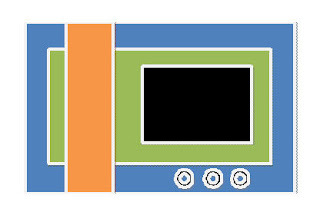 Happy Kitchen Sink Stamps Monday! 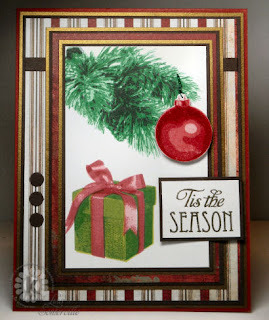 Today in the Kitchen, I'm cooking up some wonderful cards using the new Kitchen Sink Stamps Holiday Release, combined with this months Challenge. I've got a lot to share, so grab your coffee and pull up a chair! This months release is all about the holidays, below are the links for the Kitchen Sink Stamps November Release. Use code LISA10KSS to save 10% on all your Kitchen Sink Stamps purchases! There's also TWO new Mini Sets - the Mini Sets are the perfect way to try Multi Step™ Stamping, the mini sets also include a Color Recipe inside the packaging. These make GREAT stocking stuffers for the stampers on your list! International orders: Free Shipping on orders $60 and over on stamps ONLY. Please NOTE: Shipping & Handling will be charged at the time of checkout and qualifying orders will have the S&H charge refunded upon shipment. Orders with a Pre-Ordered item that qualifies for FREE Shipping, the order will be held and ship when the Pre-Ordered item is available to ship. 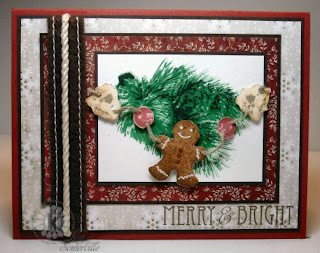 This card uses the Mini Multi Step Ornament & Stars, Multi Step Gift and Multi Step Build a Garland. I used the sketch as inspiration, taking a few creative liberties. I wanted to add some shine to the ornament as they remind me of the ones that covered my grandmothers tree, so I stamped Step #1 in Versamark (after following the steps below) and clear embossed. Pierced a small hole and wrapped some Green Wire Works as my ornament hook. The sentiment is embossed in Gold. The beautiful Gold shimmer paper is White Gold Metallic from Paper Temptress, the base is Haute Red Brawny which matches the Basic Grey Wassail paper perfectly! The pine from Build a Garland was stamped as follow: #1 Memento Cottage Ivy stamp off, #2 Memento Cottage Ivy, #3 Memento Cottage Ivy repeat 1 time, #4 Imperial Purple. The present from Multi Step Gifts is stamped as follows: #1 Memento Pear, #2 Memento Bamboo Leaves, #3 Memento Cottage Ivy, #4 Imperial Purple. The Bow: #1 Memento Rhubarb stamp off, #2-4 Memento Rhubarb. The Multi Step Ornament as follows: #1 Memento Rhubarb stamp off, #2 -5 Memento Rhubarb. I stamped the images from the Multi Step Build a Garland, then pierce holes and strung them up using Linen thread and popped them up on dimensionals over the tree branch. The sentiment is from the Multi Step Christmas Lights Mini. The pine from Build a Garland was stamped as follow: #1 Memento Cottage Ivy stamp off, #2 Memento Cottage Ivy, #3 Memento Cottage Ivy repeat 1 time, #4 Imperial Purple. The gingerbread stamp on Caramel card stock: #3 Memento Rich Cocoa, #2 Memento Potters Clay, #1 Memento Desert Sand. Add White lines with Gel Pen and buttons with Spica Glitter Pen. The Berries as follows on White: #1 Memento Rhubarb stamp off, #2-3 Memento Rhubarb. The Pop Corn as follows on White: #4 Stampin' Up! Close to Cocoa, #3 So Saffron, #2 Apricot Appeal, stamp off repeat, #1 Barely Banana, stamp off and repeat, #1 Adirondack Snow Cap (heat set). These are just beautiful, can't wait to see more! Both cards are gorgeous, Lisa! I love how you designed the garland images! I can feel all festivities with your fun desgins! These are all so wonderful, Lisa! Love how you combined all the sets on the second card...and your garland is just so cute!! Thanks so much for the fabulous sketch, Lisa!! It is so versatile!! I love what you have created with the Build a Garland set! You do such gorgeous work!! !